The Ansco Memo was not the first American 35mm still camera, but it's the oldest one in my collection. It was introduced in the mid-1920s, about the same time as the first Leicas and a decade before the introduction of today's standard 35mm film cartridge. Ansco developed a very clever, spoolless cartridge-to-cartridge transport system for it, with a rapid advance slide built into the camera back.... this system would evolve into the Agfa Rapid system that competed with Kodak's Instamatic in the 1960s. Argus followed the Model A with the B, essentially the same camera with a better lens and shutter and a higher price, which didn't make a very big splash. But then came the Model C, an all-new camera that created a dynasty. It looked like a Bakelite brick and featured a built-in but uncoupled rangefinder and a removable lens that could be used on an enlarger. Soon after it came the C2, coupling the rangefinder to the lens, and then the shutter was synchronized for flash to create the C3.... the most popular American 35mm camera ever made, remaining in production into the latter half of the 1960s. 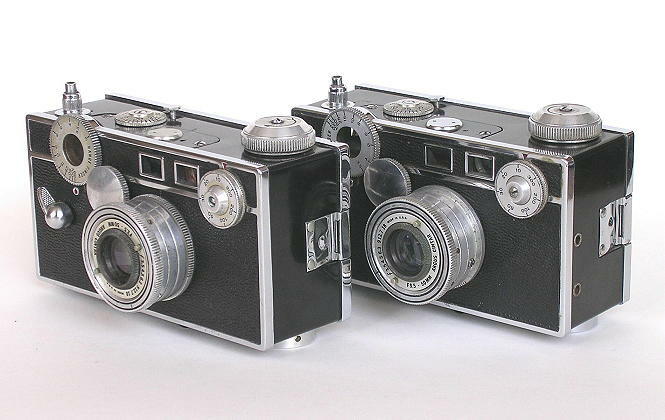 The two cameras shown here are nearly identical but are in fact two different models: the C3 on the right shows the two holes for the flash attachment, which are lacking on the C2 at left. Alongside the C series, the A continued to evolve. The A2 was a Model A with an extinction light meter added, and the A2F combined this with the AF's focusing helical.... then came a major facelift, the A3. This combined the features of the A2F in a new, streamlined all-metal body. Although its performance was no different from the plastic-bodied A's, the A3 had a visual appearance resembling a Leica. 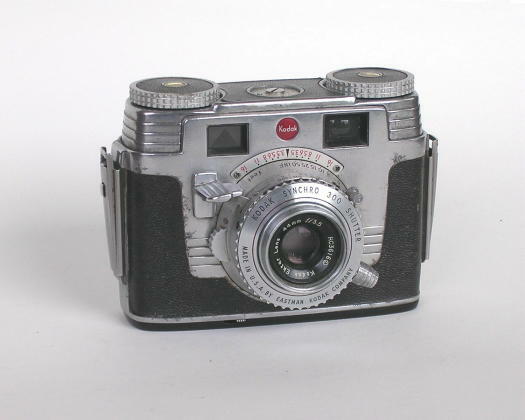 Even the extinction meter window on the front emulated the Leica's rangefinder windows, the wind-release button was placed and styled to resemble a shutter release, and the frame counter dial was placed on the front near where the Leica had its slow-speed dial. The A3 was not a world-beater in sales, but its new body formed the basis for a number of other significant cameras. These included the ColorCamera (an A3 with an electric light meter on top, America's first built-in meter), the postwar Markfinder 21 with the first bright-frame viewfinder, and the flagships of the 1950s, the C4 and C44. Immediately after World War II, the A3 body reappeared as the Argus 21 "Markfinder". In a remarkable adaptation, Argus incorporated a totally new and very unusual behind-lens shutter into the body, modifying the casting dies to accept the mechanism. Like the C3, this behind-lens shutter permitted the lens to be removed from its screw mount for use on an enlarger. In the 21, however, there was no rangefinder, and no wide or tele lenses were offered. The 21's screw mount is 38mm in diameter, and so is not compatible with the 34mm screw of the C3. 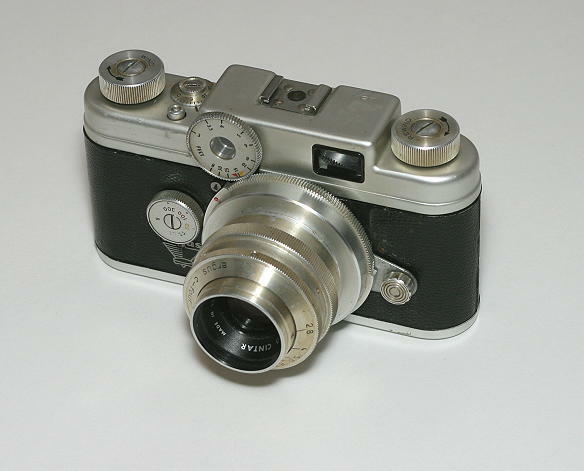 In addition to the sleek package, the 21's greatest innovation was its "Markfinder" viewfinder, which used a frosted window and mirror system to superimpose framelines into the viewfinder... a system later taken up by the Leica M3 and the entire class of Japanese leaf-shutter rangefinder cameras. Ironically, Argus couldn't figure out how to combine this feature with a rangefinder, and so they dropped it when the 21 evolved into the C4. In 1951, the Markfinder 21 was superseded by the C4. Mechanically much the same camera as the 21, the C4 gained a coupled rangefinder while losing the bright-frame finder system of the 21, and the f/3.5 lens was upgraded to f/2.8 but was no longer removable. Making the lens permanently attached permitted a sleeker adaptation of the C3's geared rangefinder coupling, and the camera handled very nicely. Inexplicably, the C3 remained more popular than the C4. This camera has been recovered with grey leather after the original covering was removed to service the shutter. An Argus C4 with a twist ... literally. What makes this camera special is the arm and knob extending from the side of the lens mount: the camera has been retrofitted with a Geiss interchangeable lens mount system. Geiss-modified C4's had a bayonet lens mount not terribly different from the later C44, and could be fitted with German-made Enna wide angle and telephoto lenses. Some people feel the Geiss mount was even better than the one on the C44, but, as with the C3, changing lenses on a Geiss C4 involved re-meshing the rangefinder coupling gears in addition to lining up the invisible bayonet: handled carelessly, it could go very wrong. 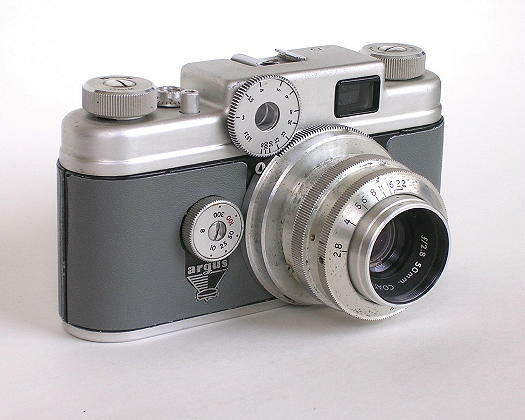 Argus' tour de force came in the mid-1950s with the C44. This was the same basic camera as the C4, but with the addition of a bayonet lens mount and an excellent set of four interchangeable lenses: 50mm f/2.8 and f/1.9 options, a 35mm wide angle and a 100mm telephoto. The 50/2.8 was a Tessar type, and one of the best Argus normal lenses. The C44 was later upgraded further with a rapid advance lever and an attachable coupled light meter, but it never produced the sales the manufacturer had hoped for. By this time, the era of the Nikon F was fast approaching and the C44's quality and features (while very good for an American 35mm) were lagging behind the times. 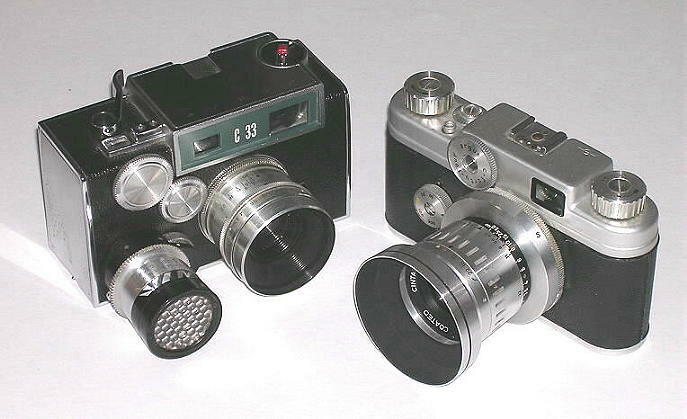 Inexplicably, Argus followed up the C44 (right) with the C33 (left). Apparently frustrated that the boxy C3 continued to outsell all of their sleeker, more modern offerings, their marketing folks apparently decided that what the world REALLY WANTED was a big, heavy, ungainly, poor-handling box... and that is exactly what they gave them. With a good combined range/viewfinder and accepting the same coupled meter that fit the later C44s, the C33 had an even better shutter, quiet, reliable and speeded from 1 second to 1/500. It also had a bayonet lens mount, reminiscent of but not interchangeable with the one on the C44, and wide angle and telephoto lenses were available for it. The camera was literally painful to use, with no fewer than 14 sharp corners on the thick, heavy body. All in all, it was a waste of a very good shutter. At least they didn't waste a good lens too: the normal lens was an f/3.5 triplet, a step down from the f/2.8 and f/1.9 offerings on the C44. There were other people besides Argus in the 35mm business, once it got started. 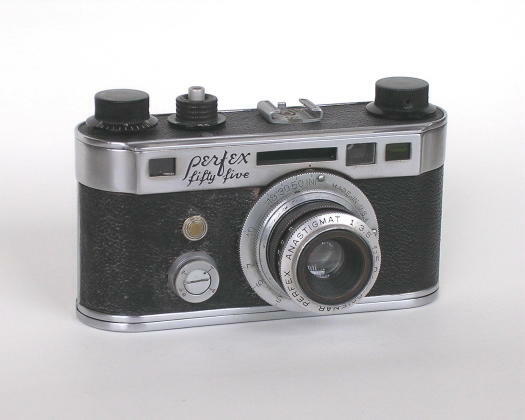 One of the more interesting was Univex, a company that started out of nowhere in 1933 with a little plastic box camera. By 1936 they had introduced an 8mm movie camera, and in the fall of 1938 they came out with a landmark camera: the Univex Mercury. Missing the title for the first American focal plane shuttered 35mm only by a few months, the Mercury did introduce the "Hot flash shoe" that finally caught hold decades later (this at a time when very few cameras could even use flash). 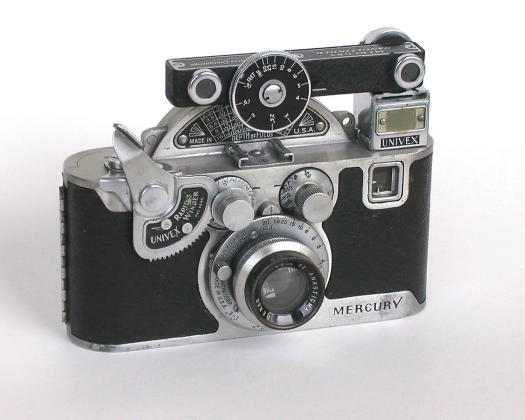 The Mercury's shutter was speeded from 1/20 to 1/1000 second (1/1500 in the top line CC1500 model), and was exceptionally accurate and reliable. The Harvard Observatory selected the Mercury shutter to use in its telescopes after evaluating more famous and expensive designs, and it saw years of successful service there. 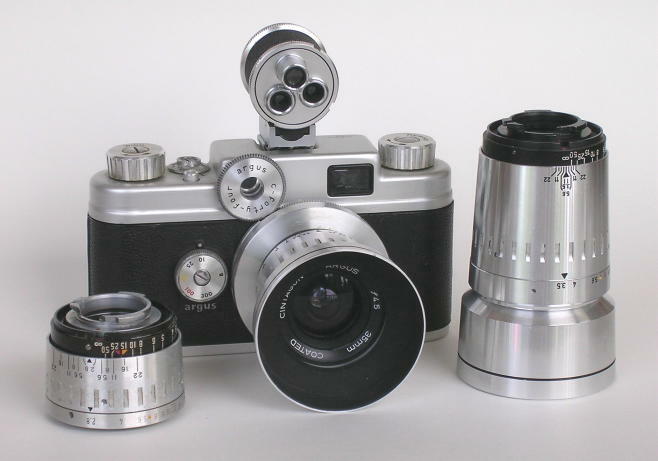 The camera in this photo shows off an accessory extinction light meter, rangefinder, rapid-wind device and f/2.0 Hexar lens. The Achilles' Heel of the Mercury was Univex's policy of designing all of their cameras to take a proprietary film load. In the spring of 1940 the Belgian film supply was shut off, and Univex and Gevaert had to scramble to set up a film manufacturing facility in the United States. This experience caused Univex to rethink the concept, and after the war they introduced new models accepting standard 35mm film spools. The first and best of these was the Mercury II. 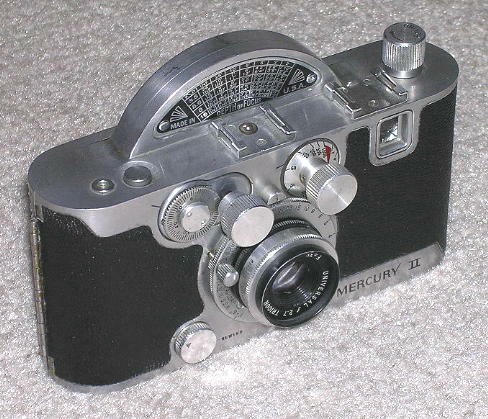 Using the same shutter and film transport systems as the original, the Mercury II was noticeably larger due to the larger cassette and the need to rewind the film. The new camera no longer accepted the rapid wind device, and no "1500" version was made. Postwar materials changes also brought unexpected effects, and the metal and leatherette of the II are not as attractive as the earlier camera; on the other hand, this is the one that you can conveniently use today, and it is a good and reliable camera. The ranks of focal plane shuttered, interchangeable lens American 35mms expanded in 1939 when the Candid Camera Corporation introduced the Perfex 44. This company had built a focal plane 35mm the previous year, called the Speed Candid, an ungainly beast better left forgotten, but the 44 was a modern, streamlined and fairly good-handling camera. It also had amazing specifications: shutter speeds from 1 second to 1/1000, a wide-base coupled rangefinder, built-in "Hot Shoe" flash synch and a built-in extinction light meter... all of the features of a $300 Contax, for under $40! The Perfex line grew through a series of derivative models: the 33 was a 44 without the slow speeds, and the 55 moved the slow speeds to a separate wind-up dial on the front. 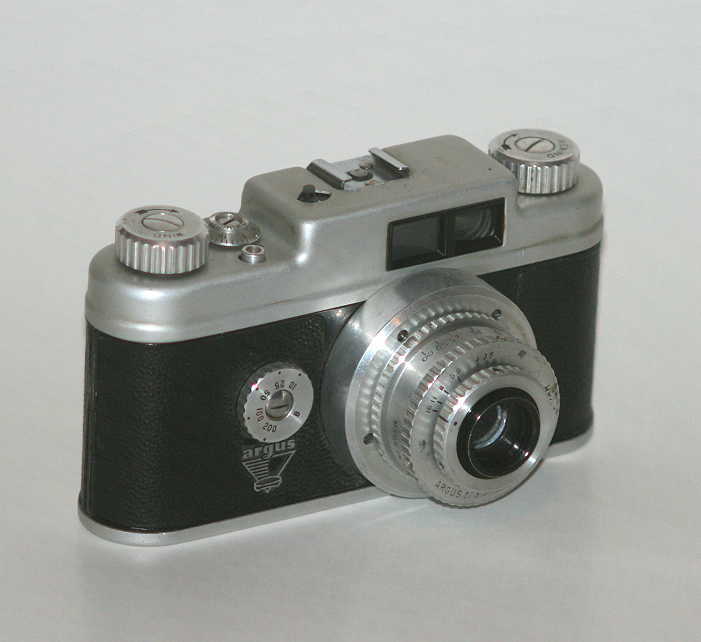 When the 55 was later upgraded with an f/2.8 lens as standard, the Model 22 was introduced: a 55 with the old f/3.5 lens and a new nameplate riveted onto the front to cover the original markings. With the 55, the design matured; there were no further changes before the war, and the camera was reintroduced in 1946 unchanged except for a coated lens and the deletion of the extinction light meter. The last model in the line was the DeLuxe of 1947; this consisted of the internal mechanisms of the 55, repackaged in a stamped sheet metal body to replace the original die castings. By this time, the manufacturer was on the verge of collapse, and not very many were made. Clearly inspired by the success of the Perfex, the Clarus followed closely in its footsteps. 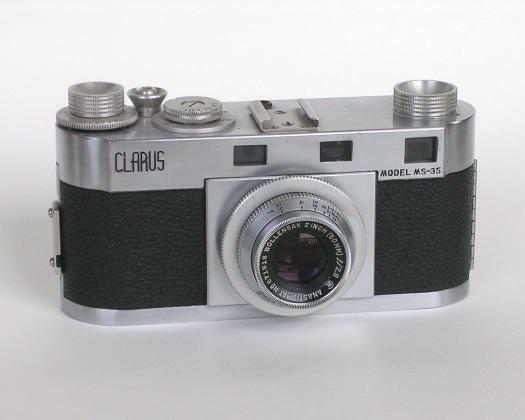 Designed before WWII, the Clarus MS35 left out the slow shutter speeds and Hot Shoe flash synch to keep things simple. Somehow it wasn't enough, and the camera appeared in numerous published listings, but never in reality, before the war. By the time the war ended, there had been plenty of time to perfect the simple design and prepare for production .... or so one would have thought. The Claruses that emerged after the war were bulky, ungainly and unreliable to the point of uselessness, though this did not prevent the makers from having the audacity to compare the camera favorably to the Leica in published advertisements. It took until 1948 to get the functional bugs out of the system, and along the way the camera went through so many midstream corrections that there are hardly any two alike - a fascinating field for collecting on that count alone. Late Claruses do work, but not especially well; shutter speeds tend to be inconsistent, and the many design adjustments did nothing to address the awkward dimensions and balance of the camera. But what about Kodak, the biggest camera maker in the country and the people who had introduced the 35mm cartridge? Well, apparently they weren't all that fond of their creation. While they continued to produce the excellent Retina line in Germany, the American corporation introduced the Bantam 828 film format and a whole line of cameras to compete against 35mm. There were some Kodak 35s, though; of course, the Ektra of 1940 was a magnificent camera, but it was too expensive to sell and so few were made that the design was never properly debugged. 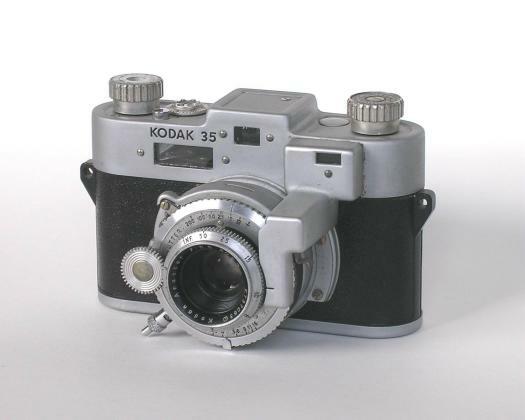 What was left, then, was the "Kodak 35" series. In their original, rangefinderless form, these were unlovely cameras that were functionally a step up from an Argus A; when the rangefinder was added, the camera became monstrously ugly .... this is what might have happened had Doctor Frankenstein been a blacksmith. The camera did work, though, and probably due only to the faith people had in the Kodak name, it sold fairly well. 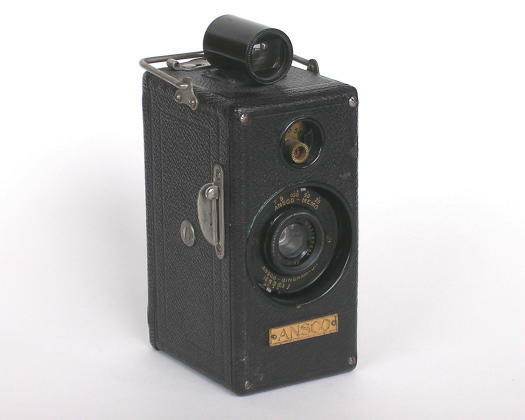 The prewar models of the camera had a self timer but no flash synch; the camera was reintroduced after the war with these features reversed, the new flash synch utilizing the space in the shutter where the self timer had been. As was the case in many Kodaks, the lens was excellent, and the shutter was mediocre. 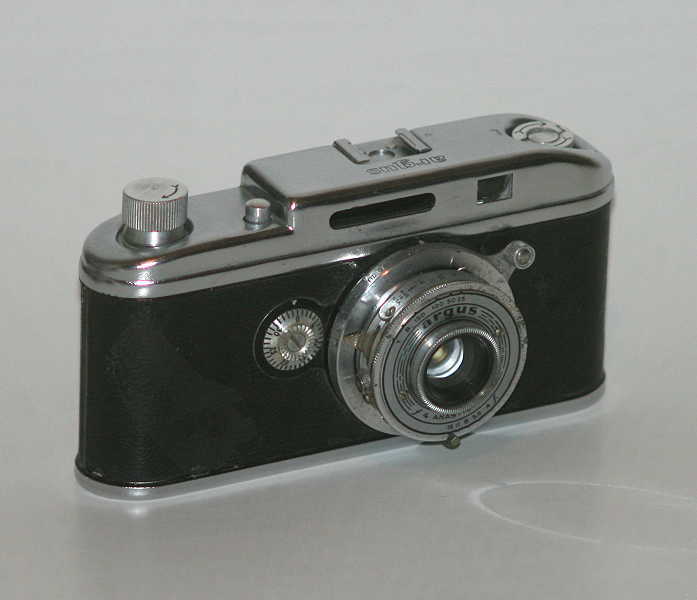 This camera is fitted with an adapter to permit use of later "PC" flash connectors, as the ASA post introduced on American cameras in the late 1940s did not find universal acceptance. After a long run of 10 years, the Kodak 35 was finally replaced in 1951 by the Signet 35. 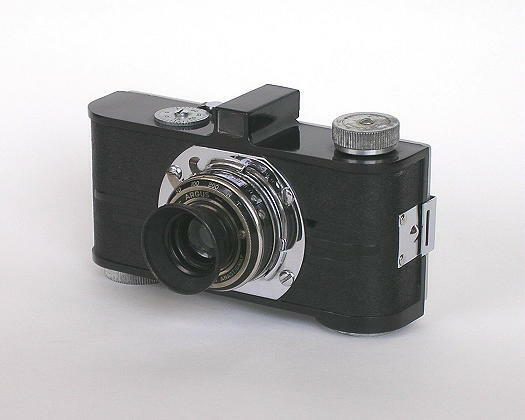 This was a sleek looking camera designed in the late-1940s "late streamline" style that can be seen as well in the Ansco Automatic Reflex and the Kodak Chevron. The lens was again excellent, the first in a leaf shuttered 35mm to carry the Ektar name; a Tessar type, it had a ball bearing focus mount in which it could focus to 2 feet with the coupled rangefinder, and its 44mm focal length gave it a slightly wider than average field of view. The shutter, on the other hand, was an embarrassment: with only two blades, if offered a limited number of speeds .... most of which don't work properly with the slightest trace of dirt. The camera, while attractive to look at, is really too small to fit comfortably in most people's hands.